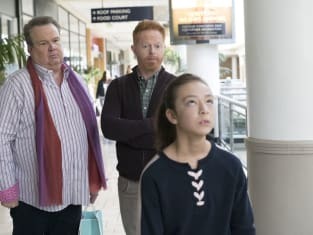 On Modern Family Season 9 Episode 18, Phil and Claire are celebrating another anniversary, but this time it's Phil who drops the ball. Meanwhile, Gloria's ex comes to town and looks exactly like Manny, making everyone question his paternity. Let's talk a bit about Gloria. When did she get so mean? I realize she was playing a joke. Haha and all that, but she's been in this country for a long time. She's been immersed in American culture, and she still acts as though she has no clue her joke was not only unfunny, but cruel. I have to admit. I was fooled all the way up until Alex popped in with DNA results. If you've ever watched a Law and Order episode, you know darn well that DNA results don't come back that fast. Back to Gloria though, the way she kept laughing while Jay was crying and Manny was devastated was borderline evil. If you want to pull a prank next time, Gloria, put a whoopie cushion in Manny's chair and leave it at that. I've noticed this trend ever since Manny was going to college. Gloria was getting him prepared for pranks from his future fraternity, so she was pranking him the entire college trip. Her excuse was that she was toughening him up. It wasn't funny then and it isn't funny now. Gone is the Gloria who put Manny on a pedestal. Their relationship was always borderline inappropriate, but now it's like she has no care left for him at all. Permalink: How many Mannys do you see through these things? She also doesn't interact with Joe, so I'm confused as to what's happened to her character because it's not good. She needs to get back to being all about her family. Come back hot-headed, but family loving Gloria. I miss you! Phil and Claire are getting back to the Phil and Claire that has always made them so endearing. Yes, Claire nailed the gift this year, but she didn't rub it in Phil's face. She was so proud of herself that she gave him a thoughtful gift. We haven't seen them so in synch for a while now, and it was heartwarming to watch them dance after over 20 years of marriage. Maybe we're on an upswing for Phil and Claire. I hope so. I've been really concerned about Mitch and Cam and their relationship. I talked about it in last week's review, wondering if they were heading toward divorce. I don't know if they are, but they came together nicely when it came to Lily, who finally made an appearance. I'm not a fan of Lily, but this storyline brought Mitch and Cam together like I haven't seen in a while. They met with her teacher together and addressed her problem, which is natural for parents of a girl Lily's age and it was good to see them address parental issues. She's been so absent in the show, it's easy to forget they're parents at all! I think the show should have the three of them more in a family setting, dealing with family and parental issues with their daughter, like they used to do in the Dunphy household, when the kids were younger. Permalink: No, not a chance. Now the Dunphy kids are doing their own thing and Phil and Claire have to deal with less and less parental stuff and more couple stuff. Their transition to empty nest is what's throwing off the show a bit. I know, their nest isn't empty, but the kids are all grown, so the dynamic is completely different than when the show first began. Hopefully, we'll have more of them finding their stride together, than at odds with each other. I'm looking for the smart one liners and the sweet family moments. 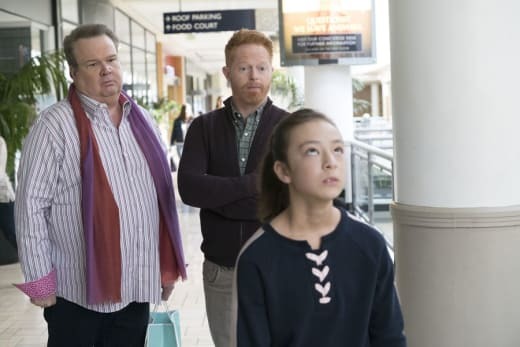 I don't think we're there anymore with Modern Family right now, and here's what needs to happen. 1. Jay and Gloria need to work on their relationship and have family moments and issues with Joe and Manny. 2. Phil and Claire need to find their place together and have adventures as a couple. 3. The Dunphy kids need to have storylines and comedy in their own right that ties back into the family dynamic. 4. Gloria needs to be nicer! 5. Mitch and Cam need to show family life with Lilly and be the sweet couple still enamored with each other. One more thing. I miss the couch scenes! Mitch and Cam. Phil and Claire. Jay and Gloria. They have historically been the hub of some of the show's funniest lines. Now the characters are on the couch alone a lot and there's no banter. Bring back the couch scenes! Did you notice the change in the couch scenes? What did you think of Gloria's cruel joke? What do you think needs to happen in the show going forward? If you've missed any Modern Family, you can catch up right here. Watch Modern Family online and join in the conversation. While you're here, catch up on all your favorite shows and reviews here at TV Fanatic!